The easiest explanation (and the one I've tended to believe) is that students' abilities are, in fact, slipping as they got older. That would be a good assumption if the test at each grade level was equally difficult. But what if the test questions were, on average (and adjusted for grade level), more difficult as students got older? Is it fair to assume a test with increasingly difficult questions would result in lower scores, even with sophisticated score scaling systems that take question difficulty into account? This begs for regression analysis. How strong is the correlation between the difficulty of the questions and the scores? 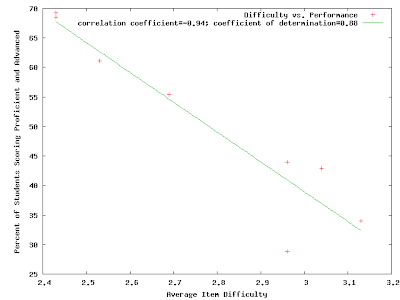 The correlation is surprisingly strong, and the coefficient of determination (R squared) is 0.88, meaning that the average item difficulty is statistically responsible for 88% of the variance in the test scores. 88%? That's big. Statistics rarely tell the whole story, but 88% raises serious doubts that it's just a matter of slipping math students. Why wouldn't the state want to maintain a steady average difficulty year-to-year? Wouldn't that make year-to-year performance comparisons more reliable? Note: This was originally posted at http://johnson.downclimb.com/2009/06/myth-of-slipping-math-student.html.